Happy Saints: Pre-order Happy Saints A to Z Cards now and get this eBook for FREE! Last 5 days!! Pre-order Happy Saints A to Z Cards now and get this eBook for FREE! Last 5 days!! 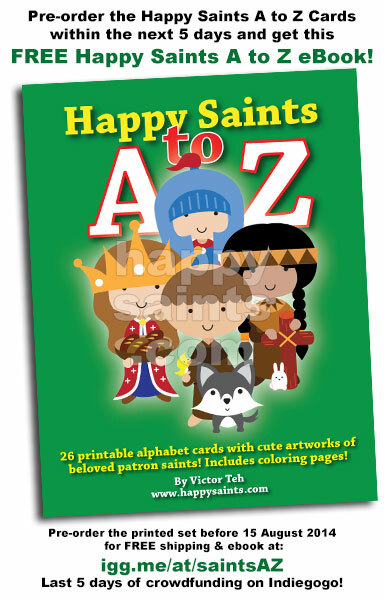 Pre-order the Happy Saints A to Z Cards now and get this PDF eBook for FREE! Last 5 days!! Here is a cover of the upcoming Happy Saints A to Z eBook! This PDF ebook features 26 printable alphabet cards with cute artworks of beloved patron saints. Coloring pages are included. This is a handy companion to the printed card set, or as a stand-alone resource. If you pre-order the printed set BEFORE 15 AUGUST 2014 (last 5 days! ), you will get this ebook for FREE. Or you can also pre-order this ebook on its own.